This week the challenge is "Christmas Critters". I used Rubbernecker stamp- freehand frame and dog with big eyes. 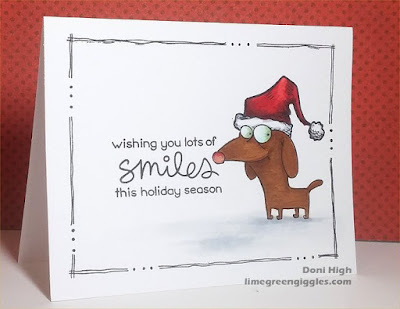 The sentiment is from Lawn Fawn - merry messages. And the cute Santa hat is from Tim Holtz - crazy birds and things. I was also going to enter it in this weeks Less is more challenge. duh, this dog is cute but not very literary ! Oh well, I am not very good at combining challenges. Very cute card...puts a smile on my face, thank you. This is a really cute card and I like the frame. This is totally cute and FUN, Doni !! hello! what an amazing CAS design...your coloring and shading is phenomenal I am so glad you played along with us at simon says stamp wednesday challenge! Super cute and adorable! I am a big fan myself of the doodling around my cards! This is so cute, love it and the frame you drew around him, works perfectly.